We haven’t had much to say about Mill St. ever since they were purchased by AB InBev and effectively stopped being a craft brewery. But they still make some pretty good beer, and they are your best option for a brew if you happen to be catching a Jay’s game at the Roger’s Centre and cannot bring yourself to drink a can of Bud Light. 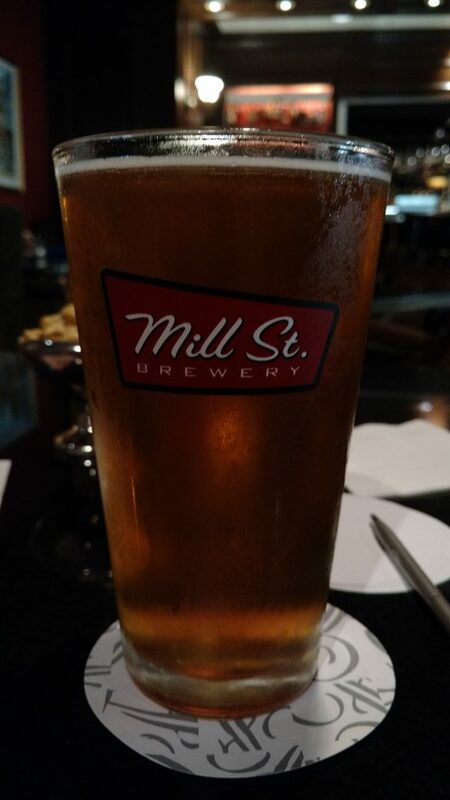 The Royal York Apiary Ale is something a little different from the usual Mill St. lineup – it is brewed exclusively for the bars at the Fairmont Royal York, using honey from the hotel’s rooftop hives. We were recently decked out in our best 1920s garb for the Gatsby Garden Party at the Spadina Museum, and we didn’t want to waste a perfectly good fascinator and bow tie. We ended up at the Royal York for drinks after dinner. Kole was craving cocktails but I zeroed in on this exclusive beer. I like exclusive things. It makes me feel swanky even though I’m not. This 5% ABV ranges in price from $7.50 a glass to $9.50 a pint in the various bars and restaurants the Royal York has. We imbibed at the Library Bar, which is a lovely watering hole if you enjoy feeling like you stepped into the 1940s. I quite like hotel bars even though they come with a hefty price tag to match. I also think bees are pretty neat, since without them the whole food chain collapses. I would love to get up on the Fairmont’s roof top some day to check out the hives. I think Kole is keen on it too since his grandfather was beekeeper. Appearance: Rich golden brown colour, no head to speak of, fairly low carbonation. Aroma: Sweet honey with rich notes of rosemary and lavender. I wonder what’s growing up on the roof to flavour that honey? Taste: Smooth on the palate, honey sweetness. Aftertaste: Sweet finish that is balanced with hops. Not overly sweet – I can’t handle sweet beers. Overall: Not bad. Solid honey brown, much better than other mass market honey brown beers I’ve had. I would order it again the next time I feel like taking myself out on a fancy night on the town. Suggested food pairing: The Library Bar gives you complimentary caramel coated popcorn and pretzels, and I went to town on these, cause I’m classy. Give a girl a break – I blew all my cash on oysters for dinner.